Rafael Nadal will have the honour of carrying the flag for the Spanish Olympic team at the Rio Games. The 14-time Grand Slam champion was chosen by the Spanish Olympic Committee to lead the team at the opening ceremony on August 5. The Rio Games will be Rafa’s third Olympics (Athens 2004, Beijing 2008). Our champ was supposed to be the flag bearer at the 2012 London Olympics but got injured before the games and was replaced by NBA player Pau Gasol. Congrats Rafa! We are so proud of you! I would like to thank the Spanish Olympic Committee the opportunity to be the standard bearer in the Olympic Games in Rio. I’m very excited. I hope the games will be great and that the entire Spanish team can do well, wish us luck. Next Rafa Roundup: Have You Ever Met Rafa on a Plane? This Fan Did! que viva Rafa N. el mejor de los deportistas espanoles. ENHORABUENA GANADOR. 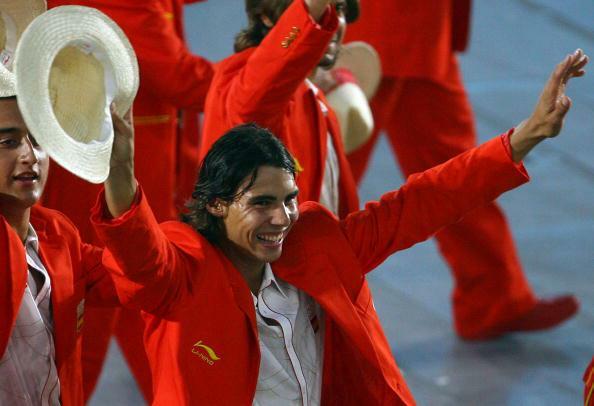 RAFA, CONGRATULARIONS on being chosen to carry Spain’s flag at the Olympics!!!! We’re SO proud of your achievements and your character as a devoted son, athlete, and the best role model for any person anywhere in the world!!!! VAMOS, RAFA!!! The Rio Games will be Rafa’s second Olympics . He only played in Beijing 2008 till now. He played doubles in Greece! It’s a pity that Brasil chose hard court instead of clay. Probably they want Federer to win the medal. I really hope that Francisco will help Rafa again. He is really a professional of hard court. That American summer slam in 2013 was amazing!! With his assist Rafa could get the second gold medal on his cup board and then next year the second Ausie Open= Double Golden Career Slam. You will be the King of Tennis Rafa!! Rafa won the Gold Medal in 2008 on fast h/c in Beijing and Fed went home without a singles medal. I know. That’s the reason why they chose hard instead of clay. Federer wants that medal so much. Of course it would be a joke if they choose grass? This is great news. Happy to see our Rafa carrying the flag as he has done all his life. He is a true Spaniard who loves his country. Vamos Rafa. An obvious choice, the ONLY real choice! VAMOS RAFA!! !